New York City just made a confession about its slave-holding past. 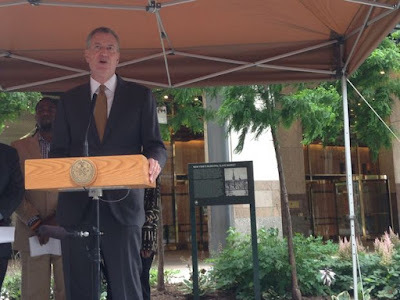 Mayor Bill de Blasio, first lady Chirlane McCray, and city officials gathered on Saturday at the corner of Wall and Water Streets to mark the spot of an 18th century slave market that was sanctioned by the city. They unveiled a historical marker describing how New York's Common Council — a precursor to the City Council — founded the market, and that it "auctioned enslaved people of African ancestry." The marker goes on to confess, in the sense of clearly admitting to past misdeeds, that city businesses, and the city itself, made vast sums of money from the slave trade. "It was a vile, vile trade that persisted for more than 50 years right here," Mayor Bill deBlasio said at a ceremonial unveiling of the marker. "You could come here any day and see it happening and, somehow, it was considered normal in this city."